The finished product! Photo courtesy of Eric Frommer Photography. Last weekend, we welcomed a new outlaw to the family. Wait, what? Don’t I mean in-law? Heck no! 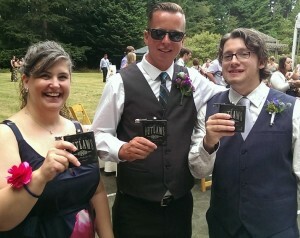 So when cousin’s little sister got hitched last weekend, her groom was welcomed with open…flasks. 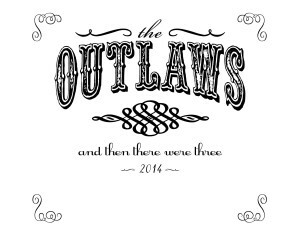 Outlaws #1 & #2 arranged a surprise initiation during the reception. The noob failed the first time, but he did solemnly accept us as his Outlaw Brother & Sister, so we put him on probation, until they have their first or second kid. Planning for this little surprise was a ton of fun. 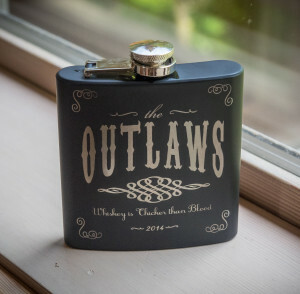 We made our plans to present Official Outlaw Flasks© pre-filled with the Official Outlaw Beverage© (whiskey). Since we had a whiskey thing going on, we were inspired by old timey bourbon labels. I combed through font sites, downloaded files I thought we could use. Then, I took to Etsy and searched until I found the site Frederick Engraving. Arika was great to work with! I’m a novice with photoediting software, so she worked with me on file formatting, and even helped me determine which artwork would look best. Isn’t it gorgeous? My husband is quite disappointed he was only born into this family and doesn’t get the Outlaw flask. Kidding aside, we’re all happy for the newlyweds. Like the rest of us, theirs was a long courtship and engagement, and it was lovely to make it Outlaw Official©. Me with my Outlaw brothers #1 (sunglasses) and Noob. Posted in craft, personal and tagged cousins, custom engraved, family, flask, Frederick Engraving, Outlaw Official, Outlaws, weddings. ← Because I like a-fishing.